Together with 13 partners from 9 member states we will kick-off a three year EU project on the Circular Economy at ESCP Europe´s Berlin Campus. The project known as Route to Pi or R2π examines how the concept of a Circular Economy (CE) can be translated into Circular Economy Business Models (CEBM). The role of ESCP Europe, participating with several renowned professors from our Berlin and Paris Campus under the lead of Prof. Dr. Sylvie Geisendorf, will be the transfer of Circular Business Models into academia. The innovation of R2π lies in having a strong business-focus, examining stimuli beyond environmental goals (including ICT and eco-innovation), and in examining the role of policy innovation (including the use of policy nudges and of “policy packages”). R2π unfolds in diverse contexts with a strong emphasis on involvement and exchange. The research design employs mixed-methods, with a strong emphasis on case studies but also including desktop research, feasibility assessments (including surveys where applicable), policy formulation & stakeholder involvement. The ultimate goal of the project is to see the widespread implementation of the CE based on successful business models to ensure sustained economic development, to minimize environmental impact and to maximize social welfare. 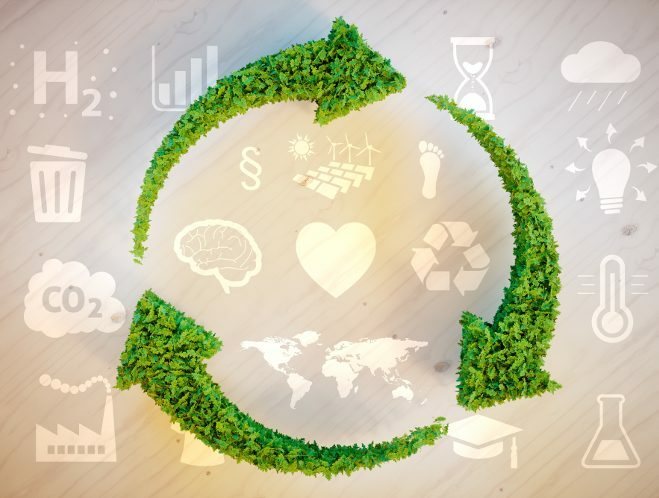 The goal of the R2π project is therefore to develop sustainable business models that would facilitate the circular economy, and to propose “policy packages” that will support these business models. The R2Pi consortium consists of 14 partners from 9 member states and associated countries. The wide range of expertise, knowledge, tools and connections existing among the consortium members will be leveraged to develop innovative practical tools and procedural guidelines that may be widely and systematically applied across many different business sectors in diverse regions and countries, across the spectrum from large established EU countries to newer and smaller member states. Together with other consortium partners, ESCP Europe will develop innovative teaching material to transfer R2π´s knowledge into business education. R2π shall contribute to move Europe onto a more sustainable, resource efficient and resilient economic track. The Route2π circular economy project has a three year timeline and will be conducted in cooperation with the ESCP Europe Paris campus.